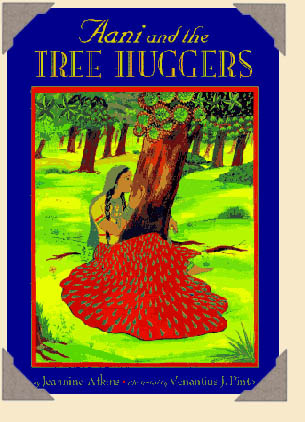 Smithsonian Notable Book of the Year; CCBC "Choices"
While writing this book, I researched the Chipko Andolan, or Hug the Tree Movement, that began in India. I admired the courage of the village girls and women and wanted to show heroes who never won personal fame, but whose actions changed the world. The tree huggers show the power of non-violent resistance which was promoted by Gandhi, used dramatically by Martin Luther King, Jr., and continued with Julia Butterfly Hill’s two-year-long stay in a redwood tree to slow down tree-cutting in California’s forests. When I visit classrooms, I ask students to name all the things trees give us. Many have stories they want to tell about their favorite trees. I encourage them to draw and write about this special tree. Teachers may want to point out the way Venantius J. Pinto painted with such loving detail. To get some particularly small images, he used paintbrushes with just three bristles. I also ask readers to talk about how words evoke the five senses, and I show them my “inspiration box” for Aani and the Tree Huggers. I ask them to name the sense each object suggests as I take out incense, a lemon, the magazine article that first inspired me, bells, a sari, and a turban. Some students have made their own inspiration boxes and begun stories of their own. Teachers may help their students turn Aani’s story into a play. Of course the trees are important “characters,” too. Arms and heads can imitate branches moved by the wind. As a writer, I need to do research, and then feel my way into the “shoes” (or sandals) of a character. What we wear changes the way we move and even think. If you’re lucky, someone in your class might be able to bring in a sari, or one can be made from a strip of cloth. I made a sari that “fits” most children using silk that’s thirty inches wide and ten feet long. To hold a sari in place, women in India traditionally tuck them into the front of underskirts, but jeans work just as well. Children can tuck them into their front of their pants, twist the cloth around their waist one and a half times, then simply pull up the cloth so it crosses and falls over one shoulder. Most feel quite elegant! Boys may prefer to try on a turban, which is just another long piece of cloth -- I use white cotton eighteen inches wide and six feet long. All they need to do is center the cloth on the back of their heads, pull it toward the front, crisscross it over the forehead, wind it around again, and tuck in the excess. White turbans are worn to keep off the blazing sun, though centuries ago they were also worn in battles to protect heads from swords. At my nearby Audubon Center, visitors sometimes play a game in which they’re blindfolded, then asked to find a tree to hug. After the blindfolds are removed, children use their sense of touch to recognize the shape and texture of “their” tree. Lee and Low Books offers an extensive classroom guide. To purchase, please visit your favorite local shop or Amazon.com.